Question 1: Which of the following best describes the raw EEG background most likely associated with this QEEG pattern? A1: Correct answer is c.
There is complete suppression of EEG background activity although there is prominent EKG artifact at display sensitivity of 3 uV/mm. The QEEG displays persistently low power over both hemispheres across all frequencies which is most consistent with diffuse suppression. Burst suppression pattern would demonstrate a "sawtooth" appearance on amplitude integrated EEG (aEEG) and repetitive brief "peaks" of higher power activity on compressed spectral array (CSA). Although extremely low amplitude delta slowing could have a similar appearance, delta activity in the 30-40 uV range would demonstrate much higher power on CSA. Non convulsive status epilepticus is most often generalized in the setting of cardiac arrest and would appear as either persistent or intermittent high power activity. Question 2: Which pattern is most likely represented at the arrows? A2: Correct answer is d.
Physiological artifacts are common in the ICU setting and can be particularly accentuated when the background is suppressed. 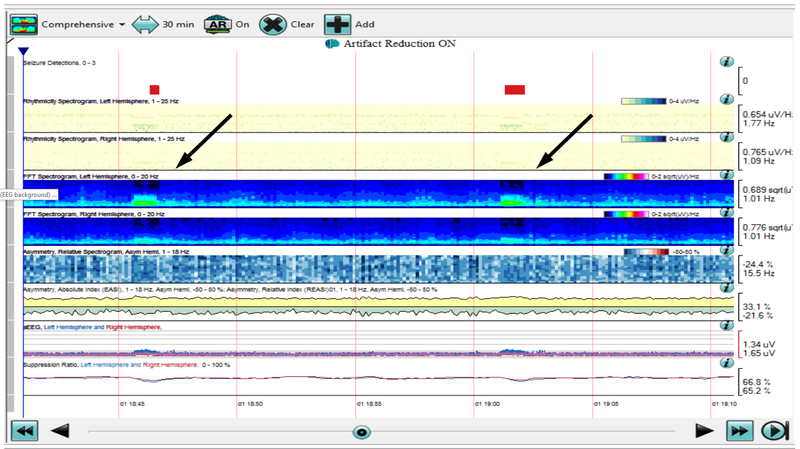 In this case, there were intermittent 2-3 minute periods of ventricular arrhythmia that was detected as low amplitude theta frequency activity on QEEG (more prominent over the left hemisphere as is typical of EKG artifact). Note this activity was also recognized by the seizure detection algorithm emphasizing the importance of concurrent raw EEG review. Shiver artifact from myogenic activity would appear as high power activity at much higher frequencies and is generally more pervasive. High amplitude generalized periodic discharges would also demonstrate higher power but at slower frequencies. Focal seizures typically appear as a "flame" shape on CSA representing evolution in frequency as the seizure progresses. This patient was declared brain dead based on neurological examination and failed apnea test. EEG can be used as an ancillary test in the determination of brain death (depending upon institutional protocol) but standard recording criteria must be met (see ACNS guideline for Minimal Technical Standards for EEG Recording in Suspected Cerebral Death, http://www.acns.org/pdf/guidelines/Guideline-3.pdf).